Arkal Disc Filters are washable pre-filters that will extend the life of the filters that follow it. If your water is visibly dirty then adding a disc filter as a first stage is highly recommended. Arkal Water Filtration Systems operate using a specially designed disc filtration technology. Thin, colour-coded polypropylene discs are diagonally grooved on both sides to a specific micron size. A series of these discs are then stacked and compressed on a specially designed spine. When stacked, the groove on top runs opposite to the groove below, creating a filtration element with a statistically significant series of valleys and traps for solids. The stack is enclosed in a corrosion and pressure resistant housing. During the filtration process, the filtration discs are tightly compressed together by the spring's power and the differential pressure, thus providing high filtration efficiency. Filtration occurs while water is percolating from the peripheral end to the core of the element. Depending on the micron rating, there are from 18 (in 400 micron discs) to 32 (in 20 micron discs) stopping points in each track, thus creating the unique in-depth filtration. The disc filters are brought in as needed, as a result there is a lead time of typically 5 to 15 working days before the Disc Filters will be ready for collection or delivery. Can supply up to 4000LPH if used with a higher micron rating, but the small size will mean more frequent cleaning. 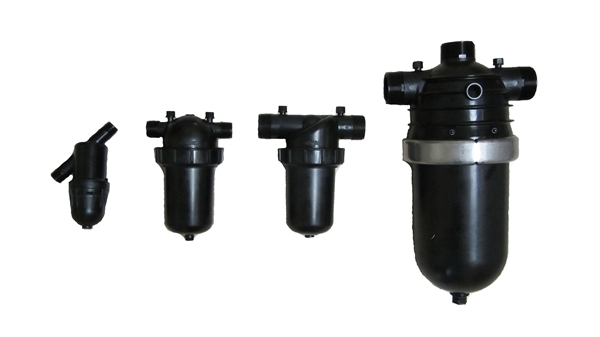 Can supply up to 4000LPH at 55um if water pressure is sufficient, it is still however not a filter with a large surface area so it will need to be cleaned frequently. Can supply up to 5000LPH at 55um if water pressure is sufficient, and has a large surface area thus reducing the need for frequent cleaning. This is the ideal size for a house. This Filter has a large surface area thus reducing the need for frequent cleaning. It is also suitable for larger applications.